Did you just finish my LeadPages review and are ready to sign up for the service? Before you do, make sure to check out my LeadPages bonuses below before you buy. I’m offering some amazing value to anyone who signs up for LeadPages under my affiliate link, and it’s always nice to get something extra for something you were going to buy anyway. You’re getting the full versions of each of the softwares, which if you purchased separately would cost you $9,384 per year. But that’s not all. Not only do you get full access to these softwares, but you also get to offer them as part of YOUR own bonus bundle by giving you the T5 Software Bonus rights... for as long as you remain an active LeadPages customer. Bonuses are the best way to sell any affiliate product. And you can easily incorporate the Tier5 bonus bundle onto any LeadPages landing page you build to really boost the number of sales you make. 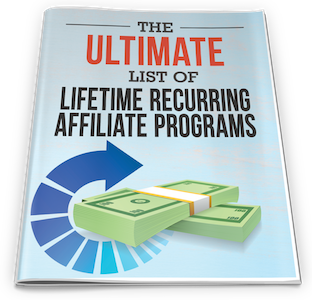 I’ve been maintaining a Google Sheet that currently contains a list of 130 lifetime recurring affiliate programs. It’s the largest list of its kind and you can view it right here. It’s constantly being updated as I find new affiliate programs. With the white-label rights to this document, you can pass it off as your own and add links back to your own site if you wish. I've had a lot of success collecting emails using this lead magnet, and you can easily use it with any LeadPages squeeze page you create. I took a look at the Facebook ads of 40 of the top internet entrepreneurs and created this amazing swipe file for you to study and use. Inside, you’ll see the entire ad copy and images of millionaire marketers like Russell Brunson, Dan Henry, Ryan Levesque, Peng Joon and more. This lead magnet will work great with Facebook ads, and you can use it to capture emails with a squeeze page created with LeadPages. Setting up your own Facebook Group is an awesome way to build your brand, and promote the products you love to use, including ClickFunnels. But what would make your group even better is if you had access to all your member’s email addresses. You can do this manually, but it’s time consuming and tedious. Instead, use the Group Convert Google Chrome extension I’ll be giving you, to capture your FB group leads with just one-click. I’ll be giving you one Silver Plan account which lets you manage up to 3 FB groups with it. This normally would cost you $10 a month, but you’ll be getting this amazing bonus for free. I also wrote a tutorial if you want to see exactly how Group Convert works. Ad Extractor is a tool I built for myself, and the extension lets you save all the Facebook ads of your competitors to your computer with a click of a button. Before you build your landing page with LeadPages, you'll want to do some research to see what's currently working by looking at other successful businesses and marketers in your niche. With Ad Extractor you can not only grab their ads, but also see what landing page it links to. I also used the extension to create my Million Dollar Ad Swipe library, and you can use it as well to create your own lead magnets. Interested in this amazing LeadPages bonus package? Then here is what you need to do. Click on THIS LINK and purchase any LeadPages plan. Send me your receipt via this contact form. Within 24 hours, I will send you an email with instructions on how to get your LeadPages bonuses. Affiliate Disclaimer: I hope you like these LeadPages bonuses. Please note that any links inside this article may be affiliate links to LeadPages. That means that if you click on one of the links and sign up, I may be compensated for it. If you do happen to click, thanks! Any money we make keeps this site running and allows us to keep producing high-quality reviews.